Click here to go straight to our products index! 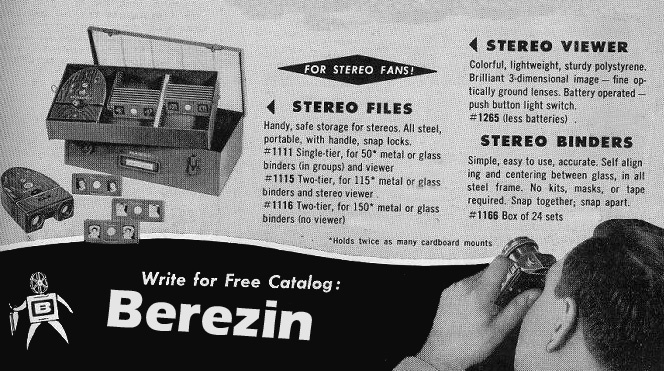 Berezin Stereo Photography Products manufactures viewers, archival stereo slide boxes and other products used by stereo photographers. In addition we offer quality View Master Reels, View Master Books, new 3D Cameras, viewer repair books, reproduction stereo cards and books about stereo photography. We service hobbyist, ophthalmic photographers, 3d mapmakers, kids and adults who love 3d, electron microscopists, professional 3d photographers and collectors. Berezin Stereo Photography Products was founded to supply low cost solutions to the problems associated with viewing Realist format slides. In the heyday of Realist format stereo slide photography there were a great number of viewers available, however, today most of those products are aging and/or expensive if available at all. Active stereo photographers, curators and collectors will entrust their slides to our archival stereo slide boxes. These boxes are exclusively offered by Berezin Stereo and are the best method for storing valuable slides to protect them from the elements. For those that prefer pages we have archival slide pages. We also offer what many people consider to be the bible of stereo photography, The World of 3-D, A Practical Guide to Stereo Photography by Jacobus G. Ferwerda. For active stereo photographers who prefer prints to slides we now offer two viewing products. The inexpensive Lorgnette card viewer for viewing stereo prints and side by side stereo images on the computer screen and the Hyper-View large format print viewer, a museum quality viewer (perfect for gallery, museum, large computer screen and even at home) for larger prints. For an inexpensive way to view and distribute your 3D photos the Mini plastic stereoscopes will view any card up to a little over 5" wide. It has a little brother too for smaller cards. War buffs of a more modern ilk will be interested in Bill Walton's Back to Basics a 3D account of boot camp. Please follow the links for more information on these excellent books. We also carry 3D glasses of all types! Including for Spy Kids! Last but not least we have a large quantity of lesser known View Master Reels and View Master Books. Berezin Stereo Photography Products 21686 Abedul, Mission Viejo, CA 92691 USA (949) 215-1554 We accept PayPal!